The park has a wide children’s play ground, which provides grounds for fun for younger as well as older children. It is spaciously designed to facilitate all the wishes from all the children. For the parents benches are the perfect lookout spot to keep an eye on your kid while enjoying your book. Seeing your kid being happy, while you have some time for yourself is the perfect mix when enjoying the warm sun. Turó Park is dedicated to the poet Eduard Marquina. The trees located at the Park are original trees, such as hundred-year-old carob tree, poplars, laurel trees, holm oaks etc. Most people value the pond as the Park’s biggest beauty. The pond is located in the north of the Park and is surrounded by trees. 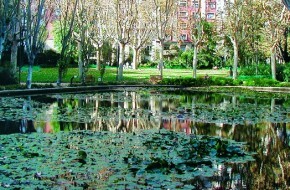 The water lilies, which flower in the spring, give a unique view and make you forget that you are in Barcelona. The character of the old amusement park comes back into the sculptures and poetry dotted around the park, bringing back the artistic and cultural heritage of this location. 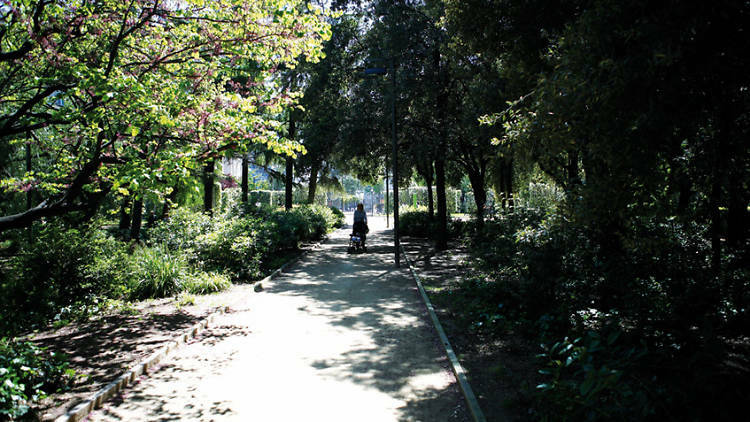 To conclude, if you are looking to spend some time away from the busy city center Park Turó is the place to go. It doesn’t matter if you want to read a book by yourself, have fun with your kids or enjoy the beautiful scenery with your partner, at the Turó Park you will feel like you just left Barcelona for a few moments. Hope you will have a lovely stay in our aparthotel for families! Sitges, the perfect family destination!